Mattel owns the Barbie brand. You should also address this concern to them, as well. *sigh* Mattel, go look at Veronica Mars. That’s how you can write a girl who’s still interesting and attractive but also actually the one who’s taking apart the computer rather than asking for help about it. Yes! Off topic a bit but speaking of which I cannot wait till Pi Day! Good god. I am horrified by that book. Steven, any way you can port the ISBN # for this book? It should be listed in the front of the book. Thank you so much for bringing this to light and asking they explain themselves. Random House must be stuck in the 1950s. If they even try to write such a horrible puke about female mechanics, I’ll shove my Allen wrenches in their eyes. Did you ever receive a response from them? Nope….so I will be shooting my segment without them to air later this month. I would be interested in hearing an update on this story. I actually worked with a company a few years ago, that developed the websites for the Mattel brand which included Barbie and Barbie Collector, Hotwheels sites etc. I was one of three women who worked on it actually, I was front-end development and the others were back end development. I flew to LA and part of my job was to teach their front-end devs, who are male by the way, to maintain the site, develop new modules etc. 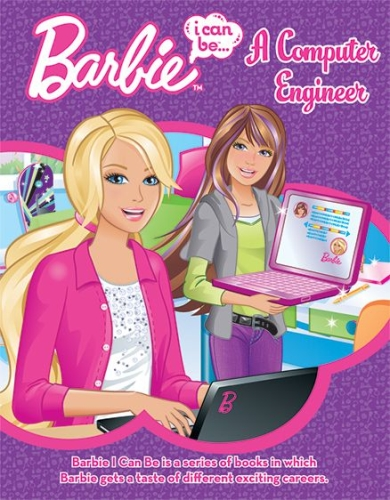 While I was there I’d jokingly asked why there wasn’t a developer Barbie and perhaps there should be one, and about a year later she came out. I thought “finally!’ so I got one, she’s next to my Wonder Woman and Super Girl Barbies. I saw a blog post today criticizing this book and I was so angry, which led me here. You’d think that Susan Marenco would do her research, and most importantly, try to empower little girls. It’s hard enough as a female in this industry as it is, and it’s increasingly difficult to get little girls interested in the sciences and engineering. This is just ridiculous and pissed me off completely. To be fair. Software development is usually a team effort with designers, developers, testers, project managers and many other key roles. It is realistic that one person would own the design while others do the actual development. But I get the complaint and it is a bit weird that she turns to the “boys” for the “hard” parts. When does your segment air? My daughter’s Girl Scout troop is studying stereotypes in media and would be very interested in hearing it. Thanks. Whoops, I mean, When DID your podcast air? Can you post the link to it? Thanks.